Dogs and people have more in common than a love of Frisbees and long walks on the beach. A new study finds that certain dogs, just like certain humans, carry a gene mutation that causes albinism — a condition that results in little or no pigment in the eyes, skin and hair. 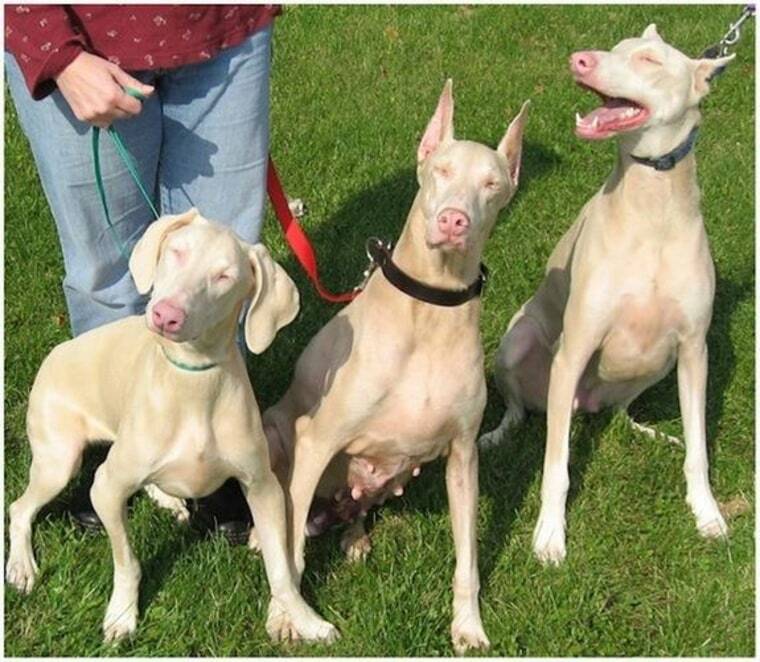 The study by researchers at Michigan State University identifies the exact genetic mutation that leads to albinism in Doberman pinschers, a discovery that has eluded veterinarians and dog breeders until now. Interestingly, the same mutated gene that causes albinism in this dog breed is also associated with a form of albinism in humans. Winkler said the gene mutation found in Doberman pinschers is responsible for a condition known as oculocutaneous albinism, which also affects humans. The condition expresses certain characteristics in both humans and dogs. "With an albino Doberman, you see a white or lighter-colored coat, pink noses and lips, along with pale irises in the eyes," Winkler said. "These traits are very similar to the characteristics humans display with this particular condition, causing light-pigmented skin and hair, along with eye discoloration and vision disturbances." Just as people with this type of albinism experience skin sensitivity to sunlight, which can result in an increased vulnerability to skin tumors, canines with the mutated gene were also found to be at higher risk for developing skin tumors, the researchers said. "We knew that albino Dobermans typically developed these types of tumors, much like [albino] humans, but we wondered what the actual increase in prevalence was between a 'white' dog and a regular-colored Doberman," said Joshua Bartoe, an assistant professor in the Department of Small Animal Clinical Sciences at Michigan State University, who co-led the study. "What we found was a significant increase in risk for development of melanoma-like tumors in the albino dogs." This is a condensed version of a report from LiveScience. Read the full report. Follow Elizabeth Palermo on Twitter @techEpalermo, Facebook or Google+. Follow Live Science @livescience,Facebook & Google+.